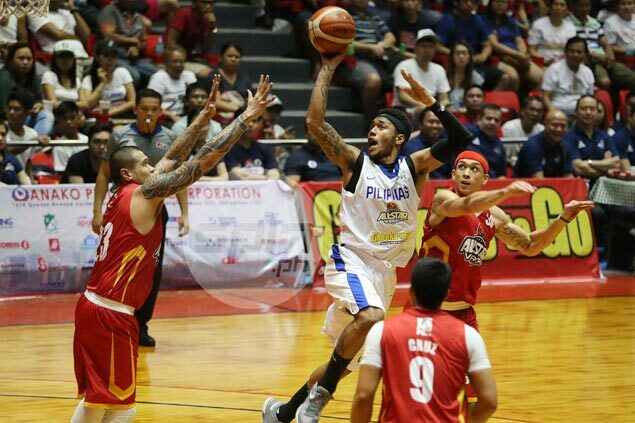 CEBU – Gilas Pilipinas found out what it needed to work on early to figure out what had to be done when it mattered as it broke away late for a 125-112 victory over the Visayas selection in the finale of the PBA All-Star Week on Sunday night. Playing their first game as a 12-man unit, the Nationals looked sluggish at the start, gaining cohesion as the game went on as they turned to a fourth-quarter breakaway to coast to the victory in a virtual tune-up game at the Hoopds Dome in Lapu-Lapu City. Calvin Abueva and Terrence Romeo sparked the bench mob as the dynamic duo led their comeback from 15 points down, building their own lead that ballooned to 17 points for a 32-point turnaround. Abueva pumped in a game-high 26 points in less than 20 minutes as The Beast wreaked havoc mostly in the second half where he scored in all but five of his total output, completing his solid play with seven boards, two steals, and one assist. Still, it was Romeo who emerge Cloudfone-All-Star game MVP as he chipped in 25 points on 8-of-13 shooting, four assists, and two boards without committing single error in 26 minutes. LA Tenorio showed the way for Visayas with 19 points and four assists, while four more players scored in double figures for a hometown side that gave Gilas all it could handle early on.